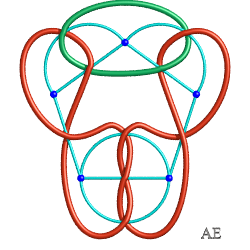 The projection on a plane of a link is said to be generic if the crossing points are all double points that have different tangents. 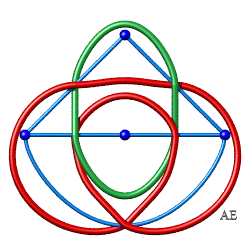 It can be considered as a planar graph all the vertices of which have degree 4. 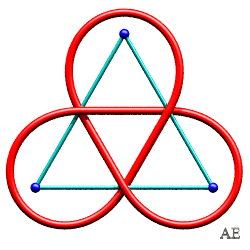 Conversely, every 4-regular planar graph is the projection of a link. 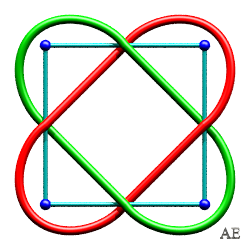 ...seen as a 4-regular graph. In order to be able to recreate the link, we need to indicate which blade passes above and which one passes below, by marking a stop in the tracing of the bottommost blade. 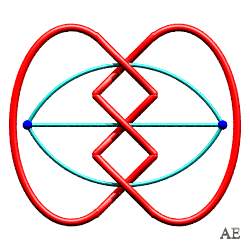 Such a figure is called a diagram of the link. 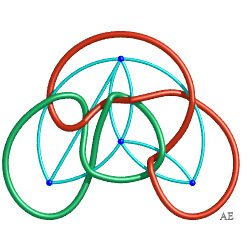 We can also "label" the vertices so as to find out the type of passage, in the following way: since all the vertices have even degree, the faces of the graph can be colored using two colors, here a and b. The vertices are labeled as positive or negative using the conventions opposite (of course, exchanging two colors exchanges + and - signs). 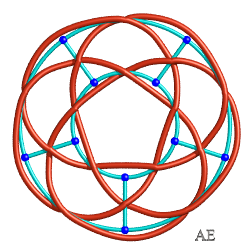 Therefore, to every 4-regular planar graph with +/- labeled vertices corresponds a unique link. 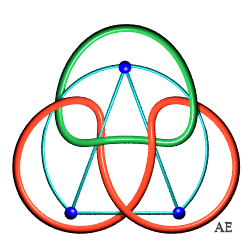 Note that the link is alternated (consecutive above-below passages) iff all the vertices of the graph have the same sign. 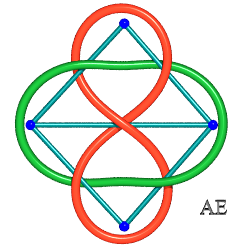 The vertices of the graph associated to the link diagram (Peter Tait,1880) are the faces with a given color (for example a), two faces being linked by an edge if they share a crossing point of the diagram. 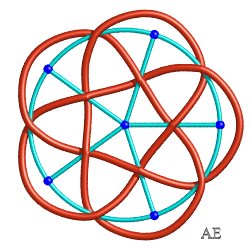 It is a planar graph (that can have multiple edges). 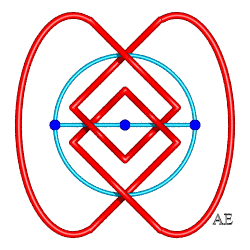 It can be obtained by placing a point at the "center" of each face and connecting these points by paths passing through the crossings. 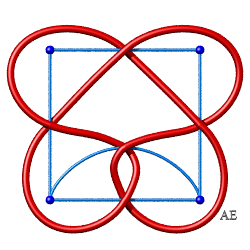 Each edge of this graph is given the sign of the crossed vertex. Conversely, the link can be recreated from the graph with "signed" edges, as indicated in the figure on the right. 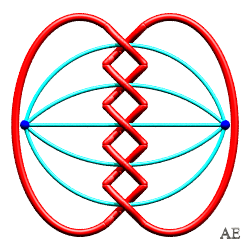 If we choose the faces of the other color, the graph we obtain is none other than the dual of the previous graph. Here are examples sorted according to the number of edges, i.e. the crossing number of the link, which we chose to be alternated. 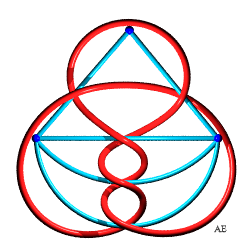 In the code name a.b.c, a is the crossing number, b the number of blades, c the order number given by Rolfsen. 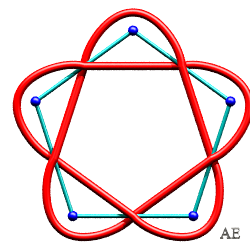 The Hopf link 2.2.1 is associated to the graph with two vertices linked by a double edge. This graph is its own dual. 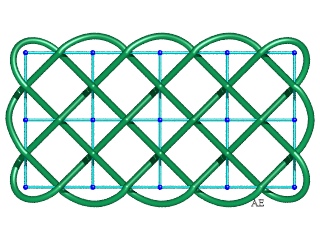 The graph of the rectangular billiard link of type (p,q) is a rectangular grid of p–1 squares by q–1 squares; opposite, the case (5,3). 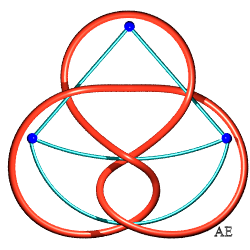 The graph of the cylindrical billiard link or Turk's head of type (p,q) is a circular grid composed of circular graphs with p concentric edges, connected by groups of p radial edges. 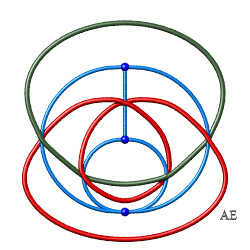 Opposite, the case (5,3) and (5,4). 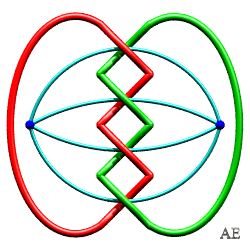 1) If two embeddings of the same abstract graph give two equivalent links. 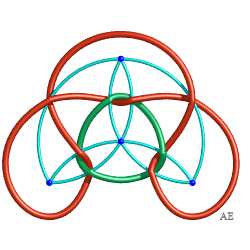 2) If two non isomorphic graphs give two non equivalent links. 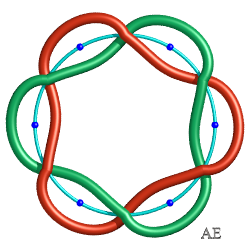 - the two blue knots K11a57 and K11a231 opposite have the same associated graph, but are not equivalent (they are "mutant knots"). 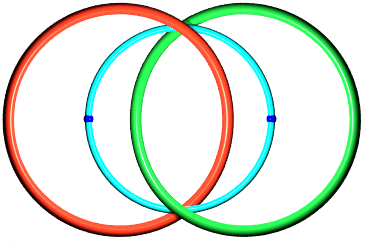 - the two light blue graphs opposite are not isomorphic (one has a vertex of degree 6 and the other has not) but the two associated links are equivalent: link 8.2.7.